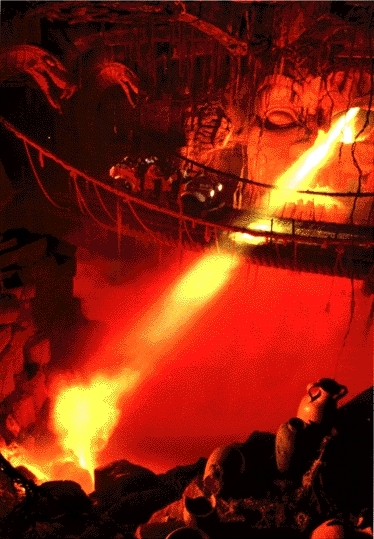 Explorers on the Indiana Jones™ Adventure encounter the "Cavern of Bubbling Death." A twisted menagerie of swirling lava, fireballs and falling debris, the cavern has as its menacing centerpiece a 45-foot-tall decaying skull of Mara. All pathways inside this massive subterranean cavern lead to unspeakable peril including a precarious path high above a molten pit. There's no turning back as the suspension bridge sways from the heat of steam vents below and Mara's destruction beams launch fireballs all around with it's flaming gaze. of the darkness, it is attractive to Mara's flaming gaze.